This year, Viking Village children had the opportunity of a Swedish camp leader who specifically came to America to participate in Viking Village. Here is an excerpt from her introduction letter. She is the daughter of Jeanette Engstrom’s friend who was attending the 2010 District convention. Jennifer added an entire Swedish experience for the children. “My name is Jennifer Lönn and I’m writing this letter because I would love to come and help you with the Viking Village camp this summer. Since my mother came home from California this spring, she's been so excited about what you do and your activities for children and teenagers. Since I really love to work with kids I thought it would be a great opportunity to be a leader at your camp. I think I could contribute with my leadership skills, my experience of working with children and of course my Swedish background. Since I’m also engaged in music and singing that is also something I could contribute with. I am 26 years old and from the small village Kolvarp south of Värnamo in Småland. Since I was a teenager I’ve been involved in different kind of kids' activities. I’ve also been a Girl Scout leader for several years so I feel more than comfortable with being a camp leader. I'm enrolled at Lund University, and I will finish my bachelor's degree this summer, with a major in business. When I'm not working I spend a lot of time playing the piano in a band in my church. I also lead a group of girls that I meet every week. We do different activities to strengthen their self confidence and raise them up to strong, self evident Swedish girls. I took music classes during high school and I play the piano, guitar and violin. While working with different youth projects I also took a number of leadership courses. Right now I'm studying at Lund University in Sweden. I've been involved in different kinds of kids' activities. At first as a volunteer, but after I graduated from high school with a major in music I started to work as a full-time paid staff with children and teenagers. During that time I had the responsibility for the youth and teenagers program in church. That included running a café for all teenagers in the local community in the church. 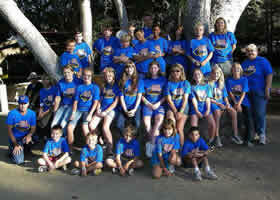 We also had a large children's activity group and children's choir in which I was one of the leaders. On Sundays, I often sang or led the children's choir. I also worked as a leader for a scout patrol, doing things like hiking, canoeing, and drama practice every week. I’ve also been in charge of a canoeing camp with the older kids in the church. My other working experience includes running a coffee shop, working in a retirement home and currently I work part time at a recruitment company with job coaching.